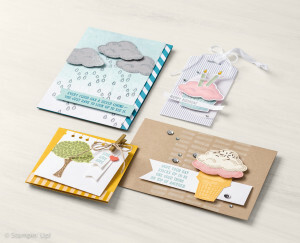 Hello everyone, here we are again for our monthly Stampin’ Creative Blog Hop and this month we decided our theme would be a “Catalogue CASE” (copy and share everything) because we often overlook the simple fact that the catalogue has beautiful creations that we can just copy and share! If you’ve hopped over from Louise I’m sure you will have enjoyed her creations, because she is amazingly creative! Whether you’ve joined me direct or come from Louise – welcome and I hope you like what I have in store for you! Below is my CASE’d version. 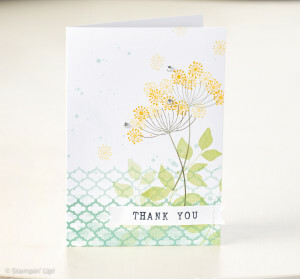 This is made with a Whisper White Notecard and has a little Stamp-a-ma-jig usage (if you want the base design to be straight & not wonky) but the rest is free stamping – I really like how the new colours of Delightful Dijon and Cucumber Crisp bring out the Soft Sky, Daffodil Delight and Bermuda Bay. The words and stems are stamped with Early Espresso and the words come from the Alphabet Rotary Stamp that I use a lot with my memory keeping. The next one I decided to CASE had to use a new stampset (that wasn’t the blog hop rules – just my own challenge!). 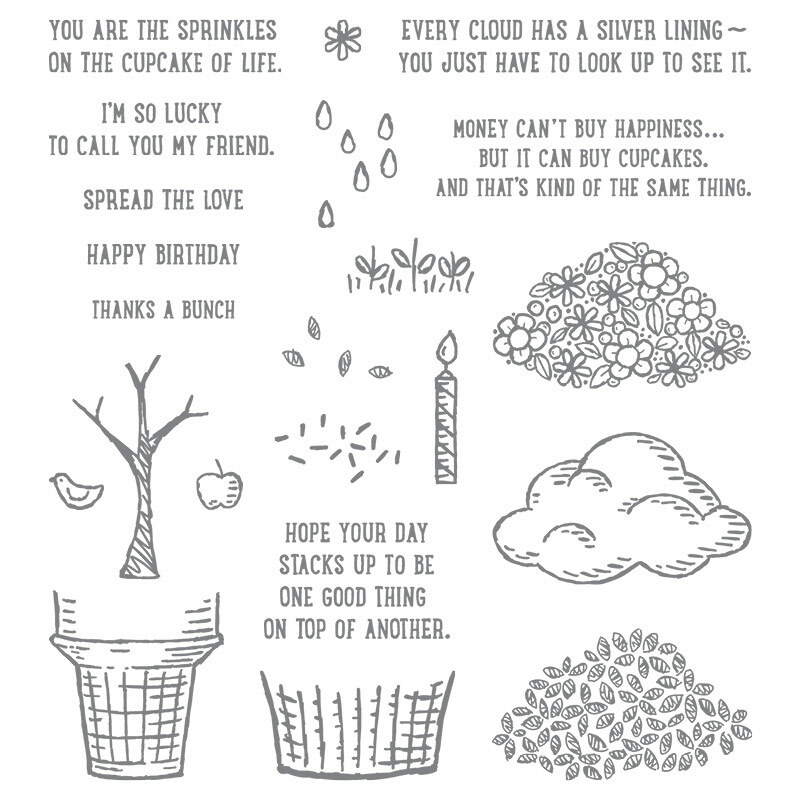 I’ve fallen in love a little tiny bit (ok a lot) with the Sprinkles of Life stampset which is this years RMHC stampset from Stampin’ Up! These charity stampsets sometimes get overlooked because they’re normally on the very back cover of the catalogue, but this year’s is really great and I think it’s the best one yet! Here are the images from the back cover. I decided to CASE the top left card because sometimes everyone has a bit of a rainy day and needs a lift. I don’t yet have all the paper stacks (gasp – I know!!) so I decided to use a little of my old, retired Marina Mist Designer Series Paper because I needed it to be the right colour, and yay I don’t mind using a bit of retired stock once in a while! Sadly, you can’t see it from the photo – obviously my hubby realised it was retired & decided to make sure it wasn’t in the photo!! Honestly, it’s there! 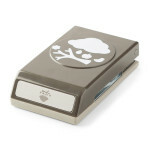 I stamped the clouds with Versamark onto Smoky Slate cardstock and then heat embossed them with Silver Emboss Powder. 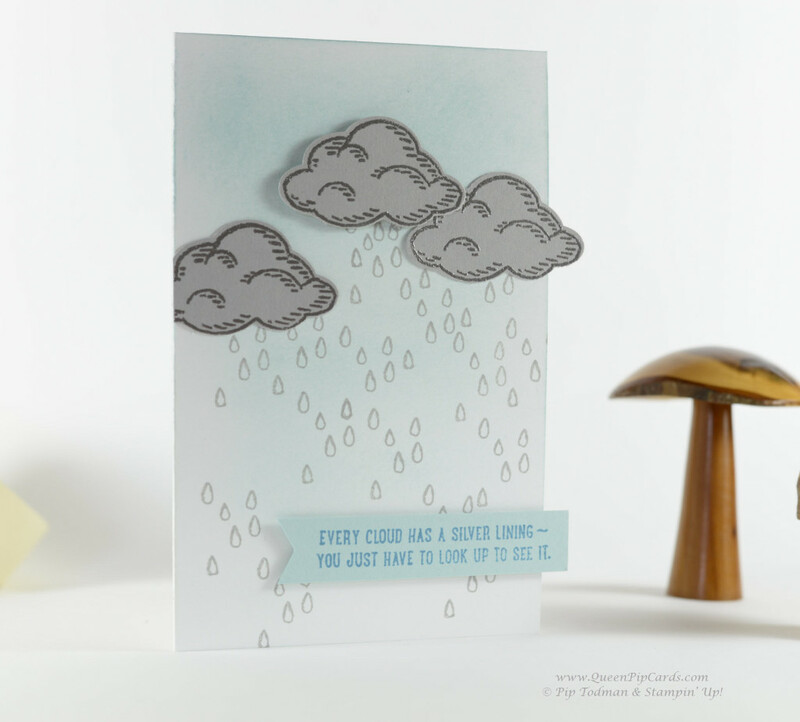 I sponged the background with Soft Sky and a touch of Marina Mist, and then stamped the rain drops in Smoky Slate. I cut the front of the card down by 1cm to allow the DSP to show through from the inside back cover. 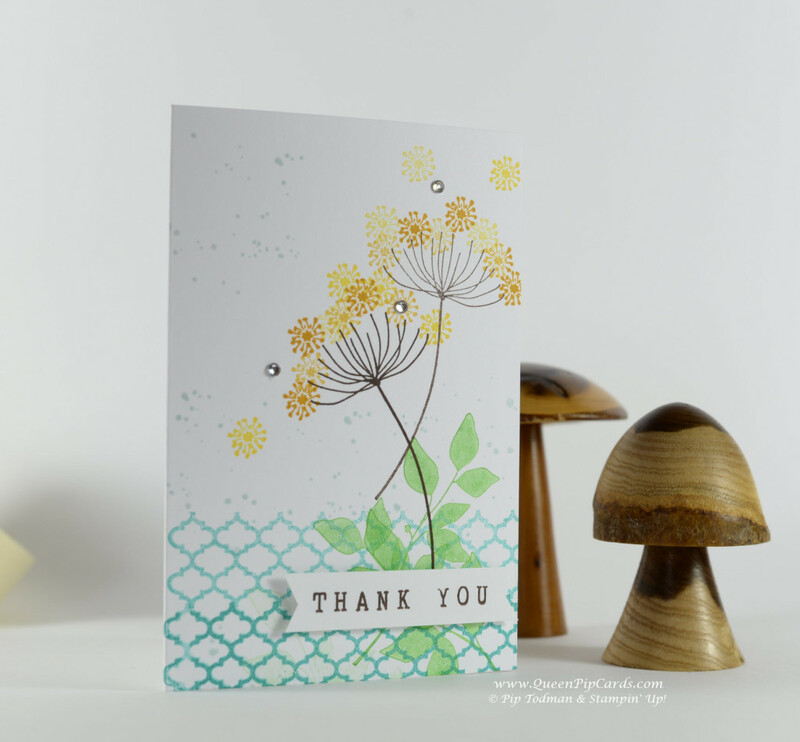 This card uses the new heavy weight Whisper White, which is really thick and excellent for card bases, along with a touch of Soft Sky card with Marina Mist stamping for the sentiment. 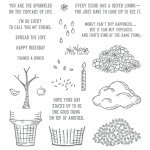 The stampset comes with a lot of stamps and some great phrases and for every set sold £2 will be donated to RMHC. But that’s not all – it also has a matching punch!!!!! Yes that’s right, I didn’t have to cut those clouds out by hand – woo hoo, it’s actually called the Tree Builder Punch and you can see how it works perfectly with the stampset when you see them together like this. So, there are my projects and I hope you liked them, and you can check out the stampsets and other products in my product line below and click on the images to go to my shop to purchase or find out more about them all, but don’t forget to come back and hop on over to Kim our stamping fairy who has some more beautiful delights in store for you. Either click on the image or this LINK. 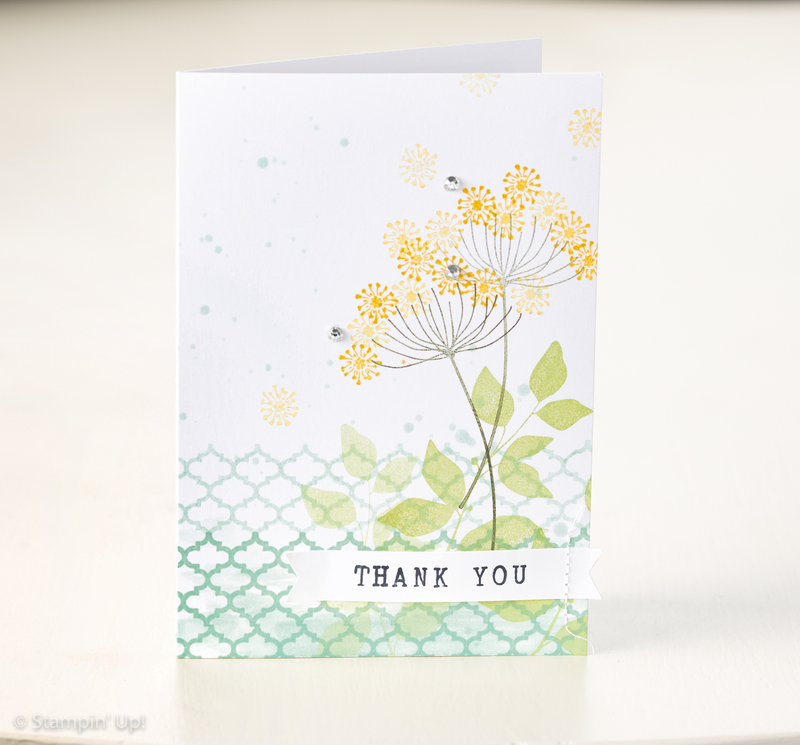 Please leave a comment below and on the blogs you really like – it makes such a difference to us to hear from you and know that we’re sharing things you like or that you enjoy a specific style or stampset. Pip – you are here! Summer Silhouettes, not in my collection, insert red face!! Love your card! It’s really pretty and isn’t the RMHC set fantastic, totally agree, best one yet! Great projects!